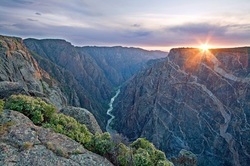 Geologically formed by water and rock, the Black Canyon of the Gunnison in western Colorado is so named for its darkness — the canyon’s great depth makes it difficult for the sun’s rays to penetrate it. The canyon’s narrowness, depth and sheer walls make it like no other canyon in North America. The scenic drive along the South Rim is the park’s most popular attraction. Tomichi Point, an overlook that provides incredible views of the canyon, is the start of a seven-mile drive to High Point. Along the way, Gunnison Point is another overlook that provides epic views of the canyon. The Painted Wall, another sight along the scenic drive, is the tallest vertical wall in the state of Colorado, rising 2,250 feet high. The North Rim is another scenic drive, but it is not as to get to — it is only accessible from the gravel road at the east end of Crawford State Park. However, this drive offers some of the most impressive views in the park, as the canyon walls that run adjacent to it are almost completely vertical. Visitors should allot two or three leisurely hours for each drive. Some of the park’s more adventurous activities like rock climbing and rafting should be attempted only by experts. The Black Canyon is known for its difficult, technical ascents. Most rock climbing takes place in the area of the North and South Chasm Walls. Peak climbing season is mid-April through June and mid-September through early November. Rafting in the park also has a reputation for toughness, as even expert rafters find the park’s waters to be a punishing challenge. The rapids are considered Class V, and some of them are actually unrunnable. Please raft at your own risk. The river’s hydraulics make rescue extremely difficult and sometimes impossible. The entrance fee is $15 per vehicle, or $7 per person. A free permit is required for all backcountry activity including hiking the inner canyon (on or off trails), rock climbing and river use. Permits can be obtained on a first-come, first-serve basis at any of the following facilities: South Rim Visitor Center, North Rim Ranger Station and East Portal registration board. There are two campgrounds within the park: North Rim Campground and South Rim Campground. South Rim Campground is the only one open year round, while North Rim Campground is only open during the spring and fall. Campgrounds costs $12 a night. There are no lodging, food or gasoline services within the park. These can all be found in surrounding communities. Water is only available in the park from mid-May through mid-October. Visitors should refrain from throwing anything — even a small stone — off the canyon. Impacts with debris from above can be fatal to anyone hiking or climbing below. The canyon is no barrier to birds, who can be seen swoop down to the inner depths of the canyons and then back up again. From the rim to the river, the park is bustling with bird species. The most majestic of them may be the great horned owl and the peregrine falcon. The great horned owl lives on the canyon rims, sharing his home with the mountain bluebird and the Steller’s ray. The peregrine falcon, the fastest member of the animal kingdom, nests in the ledges of the canyon walls. The spring and summer are the best times for birdwatching in the park. It is encouraged that visitors report any rare or unusual sightings to the park rangers. While the Ute Indians had long inhabited the area, it was John Williams Gunnison that provided the first written description of the impressive Black Canyon. He wrote that the country was “the roughest, most hilly and most cut up,” he had ever seen. Gunnison was selected to head an expedition tasked with finding a suitable railroad route along the Kansas-Nebraska border. After many surveys and attempts, the railroad that eventually made it into the area went no farther than the present town of Cimarron. At first, many of the people that passed the canyon came en route to Utah and southwestern mines, but others eventually started visiting the canyon for recreation. 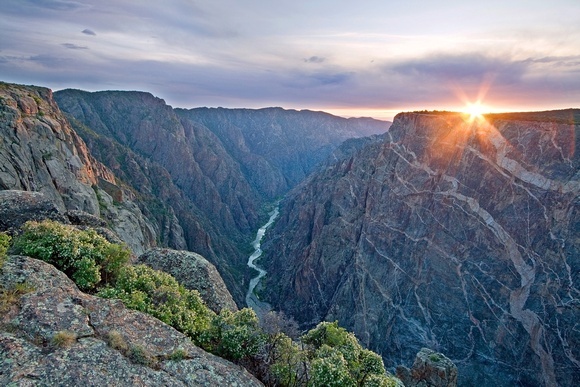 First established as a National Monument, Black Canyon of the Gunnison National Park was created on Oct. 21, 1999. 1883 – The Bryant Expedition investigates whether or not to extend the railroad by 150 miles, deciding against it. 1901 – Explorers Torrence and Fellows are the first to successfully navigate the canyon. 1916 – The first recreational visitor, Ellsworth Kolb, stays in the park. March 2, 1933 – The Black Canyon is made a National Monument.